More Than Mowers have a wide range of quality lawn and garden spreaders and seeders. If you are wanting to spread fertiliser or seed new grass then you will want to ensure an even spread. In our range we have drop spreaders and for larger tasks broadcast spreaders. Hand push models area available or towable spreaders that can be attached to ride-on mowers/tractors. Call for advice or visit our showroom in Melksham, Wiltshire. For online orders we offer Free UK mainland delivery. From Cobra, this towed broadcast spreader can be used for seed and fertilizer. It has an exactly-adj..
TurfMaster DS1000 Drop Spreader.The DS-1000 is a manual push drop spreader ideal for spreading ferti.. The TurfMaster SB4300RD Broadcast Spreader is a push broadcast spreader ideal for spreading fertilis..
TurfMaster TSB4500MG Broadcast Spreader. The TSB-4500MG is a towed broadcast spreader designed to wo..
TurfMaster SB4500MG Broadcast Spreader is a push broadcast spreader with a rain cover and 45kg capac.. 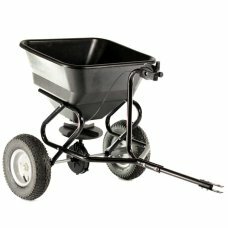 The Turfmaster SB-6000RD is a professional push broadcast spreader with a large 60kg capacity and a .. 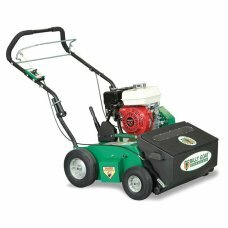 The Turfmaster TBS6000RD is a towed broadcast spreader designed to work behind your garden tractor. .. The Turfmaster SB6000SS broadcast spreader features a salt spreader and deflector the most efficient.. Turf Management Range 5.5hp Honda Eng 51cm Overseeder. The 25 lb capacity front mounted poly seed bo..